Yesterday was my first ever post-work brew day. I got in at about 18:30 and the average brew day takes me 7 hours, needing to be up for work at 06:00 the next morning I could understand being accused of insanity. Nonetheless time is ticking on and I need to get this beer in the fermenter to stand any chance of it being ready in time. I'd already weighed out grain and cleaned down vessels the night before, the long-suffering girlfriend had been primed with the job of turning the hot liquor tank on ahead of me getting in and the hoping schedule had been decided. All things intended to get me started as quickly as possible, shortening the brew day as much as I could. Mashed in by 7pm, rolling boil by 8.30, first hop addition 5 minutes later, flame out and chilling before 22:00, aerating wort for the first time, yeast pitched and tidied up by 23:30. Phew. Busy but fun. 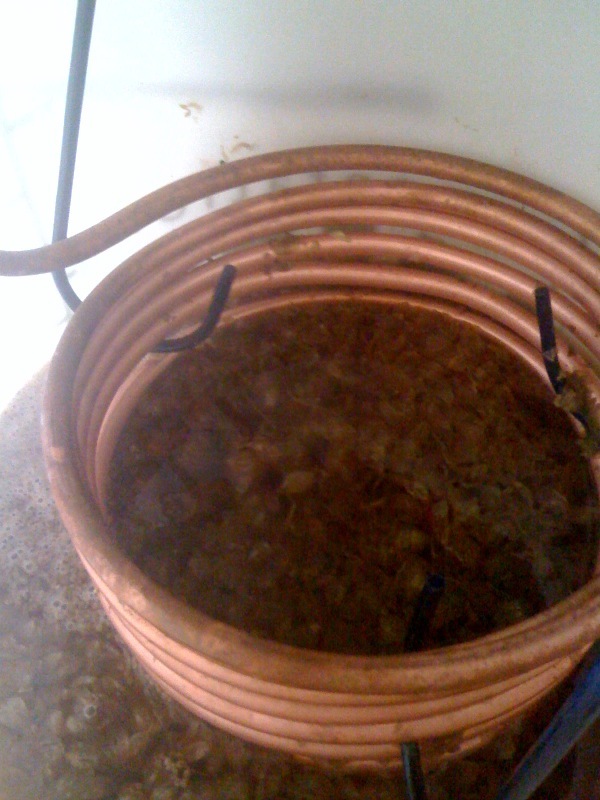 Didn't finish too late and only a couple of minor hiccups: improvements to my immersion chiller didn't 'improve' so much as 'worsen' and my hop strainer MUST be soldered sometime soon because it keeps breaking in half part way through the boil. I ended with 13 litres at 1045 when I planned for 15 litres at 1040. I only sparged once however and chucked some extra grain in to try and counter the efficiency hit. IBU's will come in around 21 and the aeration seems to have made a real difference to fermentation kicking off. All things considered I'm happy with the result.